At the time of this posting, the package was ESPN.com’s featured story on the site’s main page. But that changes pretty often, so here is a screen shot. 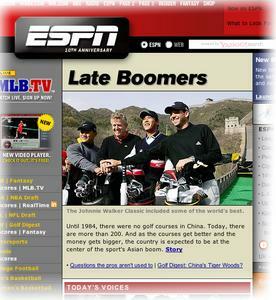 It’s also the lead story on ESPN.com’s golf page (screen shot). Filed under Blog. Tagged bmwasianopen, china, danwashburn, espn.com, golf, stories, tournaments.